Many industrial processes are dependent on the transport of liquids between different kinds of tanks, kettles and turbines. Often, there are certain demands on the temperature, which makes it of importance to apply thermal insulation around the pipelines. For example, this is the case in many processes in the petrochemical industry, in which the temperature has a high influence on the viscosity of the oil and pressure in the pipeline. As with kettle insulation, this also decreases energy loss and a higher profitablility of your installation. The continuity of your production process is strongly dependent on the flow of these liquids. 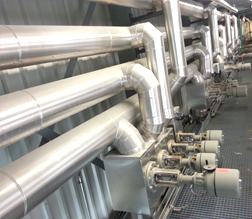 By applying quality thermal insulation to the pipelines, the liquids don't thicken up, avoiding a slowdown or shutdown of the production process. Because the pipelines play an important role in the production process, it is also important tot consider the protective function of the insulation. It's the perfect protection against outside influences, like rain, snow or freezing. It also protects your staff, because they never come in direct contact with the pipelines. Also, condensation is prevented, which lowers the energy loss. 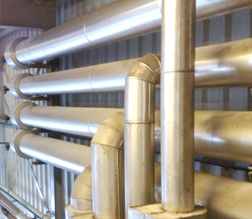 Contact us for more information about the possibilities for pipeline insulation. Industrial area "De Vergulde Hand"